Flight is inspired by the true story of an Iranian refugee who lived at the Charles de Gaulle airport for 18 years. 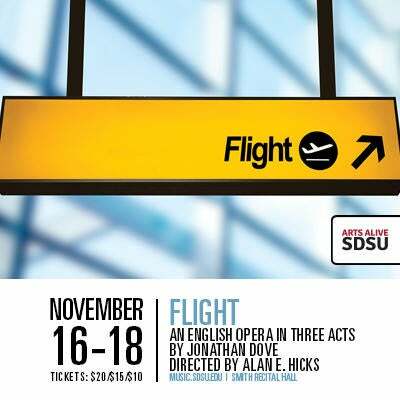 This is also the premiere opera performance under the direction of Alan E. Hicks, who serves a joint appointment with the San Diego Opera and SDSU. 2) Download PayByPhone app, call 1-888-515-7275, or enter m2.paybyphone.com on your mobile browser. 3) Pay-by-License Plate stations are located at the top level of Parking Structure 12 for $3/hour.